“I am a woman acting of her own will and desire. Do not attempt to contact me after this communication. In all likelihood, I am no longer here. These lines mark the beginning of the note my colleague Dr Joseph Hessler presented me with three years ago, along with the other materials I was tasked to compile into a dossier meant to inform a State Defense Report. I didn’t. Instead, they became the following manuscript, which, with the now late Dr Hessler’s assistance, I have prepared for the public as TRIANGULUM. 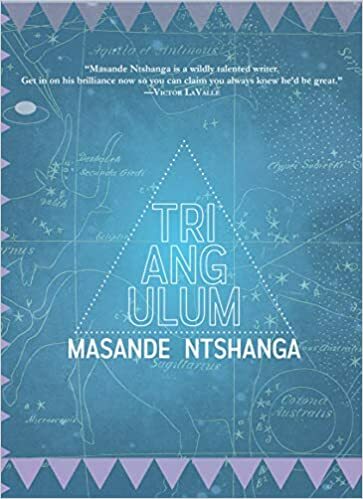 When the South African National Space Agency receives a mysterious box from an equally mysterious woman saying that the end of the world is near, the story of the post-apartheid period unfolds under the form of a manuscript named TRIANGULUM. The narrative takes us from the 1990s to 2040 into the memories of a mysterious narrator who recalls her teenage days, her friends and the haunting memory of her dead mother. It is the disappearance of three girls from their town that finally decides the narrator to go further in her search for clues of her mother’s abduction and death. Her journey leads her from her hometown to a laboratory and finally into a forest in which she hopes to find out what really happened to her mother. Situated between science-fiction to philosophical fable and historical criticism, Masande Ntshanga’s multi-genre novel deals with a large number of topics of today’s world, from racism to ecologic urgency, and also opens a window onto a future that may not be as incredible as it first appears. In this modern coming-of-age tale, Masande Nsthanga, awarded the PEN International New Voices Award in 2013, takes us on dystopic journey into the most suprising places, and also on a journey into the human soul haunted by the past, revolted by injustice and hungry for freedom. Ioana Danaila was born in Romania. She graduated from University Lyon 2 Lumière with a Masters in African Postcolonial Literature and a First degree in French for Non-Francophone people. She is the author of a collection of short stories and a translator of books from French to Romanian. She is trilingual in Romanian, French and English, and teaches English language and literature to highschool students in France. Is it an escape from reality? “ Miss Mai was quiet and seemed to hesitate. From her studio in Brooklyn, Aya Dane paints the world in vivid colours. In the appealing, yet alien world of the United States, Aya’s art is both her refuge and her way of relating to the others, until a mysterious client asks her to paint a canvass that will rush the past back to the present. From a modest neighbourhood in Tangiers to international fame in the high society of Cambridge, Massachussets, her life is constantly swaying between unspoken traumas from childhood and an unbreakable sense of freedom. Aya’s story is is a lucid and powerful narrative in which nothing is left out, although not everything is clearly unveiled. In a brilliantly refined prose that mixes powerful images vividly painted with refined poetry and infinite melancholy, Mhani Alaoui draws the destiny of a woman who, because she cannot break free from her past, chooses to live in her own world of colours. Between Frida Khalo’s paintings and what could be an anti-Dorian Grey figure, in a remarkable display the author defines as “a kind of insane chronology, one where the mind takes over time, the past, present and future”, time becomes a to-and-forth movement that makes the narrative only more insightful. Is, then, art life reinvented? Is it an escape from reality? Both questions lead to a kaleidoscope of answers as Aya Dane weaves a kaleidoscopic vision of art, memory and longing for home that goes beyond time and space. When the Lozi princess Likando, heir to the throne, is aggressed by a group of “mixed-breeds”, people with parents of different origins, before her maturity ceremony, she embarks on an incredible adventure which brings her before the legendary Ghost of Africa, a terrorizing figure people believe to be a demon dominating the territory where the Lozi tribe and many others live. In this alert historic fantasy novel, Venancio Gomani displays a wide range of characters both fascinating and troubling. The elegant writing style mirrors an almost Shakespearian plot inspired by oral stories about love, rivlary and betrayal, and in which oral tradition mingles with history. In an African mythical land, where the world of spirits and the world of humans intertwine, where stories and History always go together, story-telling is one of the essential forms of knowledge passed on from one generation to another. It is from this immense immemorial heritage that Venancio Gomani takes his inspiration. The first from the series Ghost Tribes, the novel The Ghost of Africa introduces an enigmatic character whose fame cut across generations and created an aura of fear and fantasy. What the novel points at, finally, are the individual stories that grow and entangle to form a vast, complex web of tales that create the background of History and people’s lives. Here is an tribute to story-telling, legends and tradition who necessarily speak about what lies ahead. 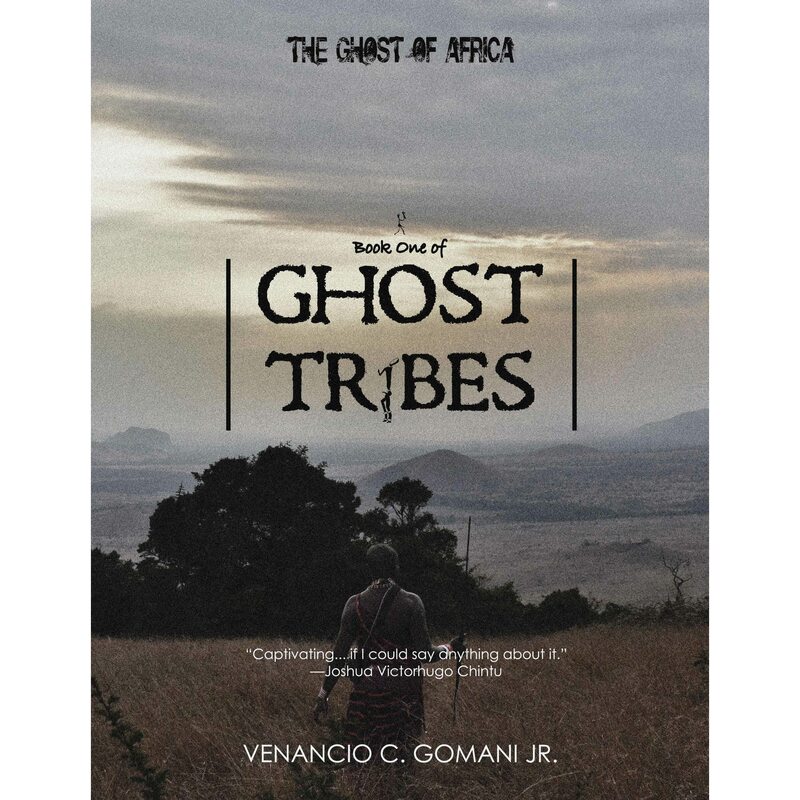 Ghost Tribes: The Ghost of Africa by Venancio C. Gomani Jr.
A young woman learns a hidden truth about her fiancé just before their engagement party. An elderly widow and her old flame meet again forty years later. A divorcée gets help from her ex-husband when moving into a new house and bond again. In these domestic scenes, Sefi Atta manages to capture the intimate atmosphere of the family cell not as a homely, cosy cocoon, but as a complex labyrinth of emotions and ties which never cease to change. What the plays have in common is staging moments of revelation, moments when truth is made public and no one, not even the closest or loved ones, cannot hide it or turn away from it any more. The langage and rather short length of the plays contrasts with the incredibly complex and multi-facetted relations the characters have : everyday life situations are exposed so as to make us reflect not only on parenthood, married life or friendship means, but also to see how domestic life echoes onto the social relations at a larger scale. Between family and nation the difference is smaller than it seems, because the tensions within the home are always linked in some way to the bigger picture. Sefi Atta’s brilliant collection of plays is a way of peaking into the intimacy of the home where the sound of the outside world is always close ; students, feminists, elderly lovers, all discover how relations with the closest people are infinitely rich and risky. The stage, the perfect compromise between home and public place, is also the place of revelations within the family ties and within the human soul. In an imaginary country called Zimgania, leading a quiet life, Saga, the son of an ordinary family leading a quiet life, is living his typical adolescent experiences with his friends. However, when he sees his closed ones affected by the conflict and seriously threatened, he decides to join the resistance. When the government in power spreads fear throughout the country and students start to react against the oppression, his fight will take proportions that he would never have imagined. In this satirical and witty novel, Dr Nat Tanoh gives a vivid picture of what young people’s life is like in oppressive regimes ; what their aspirations, dreams, leasure and fears are ; what, finally, their lives look like. The violence with which the political authority unfolds in everyday life and influences human relations makes Saga act. In his first novel, Dr Nat Tanoh captures a modern, yet tense African world, in which coming of age is never easy ; becoming a man overnight is, therefore, not easy for Saga either, especially that love is an inevitable passage to adulthood. And love has Zara’s face, a beautiful, kind and witty image, but also a frightening one in a world in which nothing seems to be what is looks like. It is in this world that Saga’s rite of passage occurs under the form of the resistance to an oppressive regime, but which is never totally shown in a dark or dramatic light. Laughter and puns, as well as dramatic scenes and conflicts, populate Tanoh’s novel to reveal a world much like our own, wherever it may be. In today’s posh side of Lagos, Remi, a card shop owner, meets Frances at a party. It is an ordinary day, at an ordinary mundane event- maybe too ordinary not to be suspect. Could she be the CIA agent that Tunde, Remi’s husband, suspects her of being, an agent trying to collect information about the social and political situation in Nigeria ? In the highlife atmosphere of the sophisticated places of the Nigerian metropolis, the political turmoil and ghosts of Biafra War still haunt people’s spirits- such is the background of this unexpected encounter which, in a slow and deeply insightful way, takes out the several aspects from in Remi’s own life, her childhood, her family, her deep connection to her native country. After A Bit of Difference and News From Home, Sefi Atta’s refined narrative highlights how relations between people from different cultures can make us question our own past, life experience or principles. The multi-layered discussions between the protagonists, embedded in the main story, underline the complex approach to one’s own culture and country that is only made possible through a foreign perspective. The Nigeria depicted in Sefi Atta’s novel is not just conflicted, fragile or immensely diverse. It is also an image of anyone’s country that, just like individuals, has its own skeletons in the cupboard as well as its own moments of grace. What Remi is faced with, finally, is, apart from all the consequences of interculturality, a new view of her own country and the political turmoil it faces, a view of her place within her own community and family because, for Remi, no man, or woman, is an island. “Almost half a century has passed since the Nigerian Civil War ended. But memories die hard, because a million or more perished in that internecine struggle, the majority women and children, who were starved to death. In this vast picture of the Nigerian-Biafran War showing a comprehensive portrait of Nigeria and, to a larger extent, of West Africa in the 1960s, Al J. Venter not only writes about the war in all its complexity, but also makes the reader live the war. Through his incredible account in which personal experience mingles with historical facts, the multiples faces of the first fully mediatized war in the 20th century become more and more visible to the public as they mix with individual stories about it. Al J. Venter also accompanies his book with numerous rare photographies of people’s dialy life during the war, from atrocities to domestic scenes. What is also enriching is the enormous number of testimonies and witness accounts from many war pilots and journalists of the time. The personal touch and experience, as well as the insightful analysis of the events and atmosphere of the time, give the book a deeply human dimension- it is, eventually, what makes History an everyday experience and collective contribution. More than “just another” history book, Venter’s account is a true historical document which allows older as well as younger generations to understand a bit more about this complex ethnic civil war that largely shaped the political present situation of Nigeria. Grace, a young independent woman living in the UK, comes to Lagos only to embark on a thrilling adventure that starts in the streets of Lagos and ends up in London, in a totally different picture. Dosun Adeleye’s novel is the story of this character’s life: a fearless, ambitious character nevertheless dominated by the fear of being abandoned as well as by the longing of being cared for. From a complicated childhood spent mostly in her grandparents’ house and far from her parents, to a busy and accomplished professional life, Grace also carries with her a haunting secret. The motif of the baby “stolen” from its biological father, central in Dosun Adeleye’s novel, is questioned as it refers to the “bigger picture” of this socio-cultural element often present in popular literature and cinema. This bigger picture offers us the portrait of a complicated and sometimes painful love life, in which destiny doesn’t often match the idea of life one had in the first place. What is more, it is not only the notion of destiny that is challenged, but also a certain cliché about “genetic” predestination. What the reader discovers instead is a dynamic story of a quest for love, whatever the cost, whatever the sacrifices, whatever the obstacles. Almost like a modern fairytale, the novel draws not a sweet or overromanticized portrait of the main character, but a story full of fearless hope. Ioana Danaila was born in Romania. She graduated from University Lyon 2 Lumière with a Masters in African Postcolonial Literature and a First degree in French for Non-Francophone people. She published a collection of short stories and translated books from French to Romanian. She speaks Romanian, French, English, and Spanish, and teaches English language and literature to highschool students in France. Out of Africa’s twentieth century wars, this book reconstructs the story of a war that seems to have been too little documented over the last decades. From the analysis of the situation of Angola in the 1960s (in the larger context of the Cold War) to a detailed overview of the allied troops in 1975-1976, this historic insight concentrates more on Operation Carlotta, or the intervention of Cuban forces, during these years. The analyses also help us understand the complex situation of many African countries at the time who, after independence, went through civil wars, alimented by long-term local rivalries and interests. With a detailed insight on the Angolan context, over 100 rare pictures, and its historical past, especially the period of the Portuguese rule, the authors give the reader a wide perspective on a complex historical phenomenon engaging several internal parties and coalitions as well as several foreign military forces. Adrien Fontanellaz and Tom Cooper’s book is an interesting and enriching reading, destined not only to historians, but also to non specialists who want to understand one of the most complex historical events in the mid- twentieth century Africa, as well as its implications outside Angola. More than history, War of Intervention in Angola is food for thought. 978-1911628194 / Helion and Company, Africa@War Series, August 15, 2018. When Ola, a Nigerian sixteen-year old girl who just moved to Harlem, finds out that she is pregnant with twins, she knows that she is at a crossroads and that she will have to make it on her own for her family. What she doesn’t know is that she is not as alone as she thinks and that the events in her life will sometimes be the fruit of fate and magic. The story of Ola’s family is also the story of her coming of age, from a sixteen-year old young girl who wakes up into a tough, unknown world to the mother who, despite her stubbornness and her desire to control everything, discovers that not everything is controllable and that magic is as much a part of life as everyday reality. Above all, she will learn that, to quote one of the chapter titles, “life is a team sport”. In this novella, Zeena Nackerdien explores the rich cultural identity of the mythical district of Harlem starting with a sensible and beautifully written introductory chapter called “Hope” in which we discover the roots of the multi-ethnic community living there. This district, which is a micro-universe in itself and home to a remarcable diversity of cultures and individual (hi)stories, is the setting of the story of Ola’s family that witnesses how magic can intrude unsurprisingly in daily life. This “tale of bullies and deception” combines fantasy elements with Yoruba traditions and realistic descriptions in modern-day Harlem to show an extraordinarily diverse yet tough world, in which fantastic fairies sing their pipes to clear the world from bullies, and bring love back to life.